The far northwest... land of blue skies and hope... it's a committing trip in an insecure summer like this, but we piled the car up with boulder mats and headed through horizontal rain for 6 hours, ending up in Kinlochbervie sheltering in the bar playing pool until chased out into the rain and the tents. The morning broke clear and as promised: wall to wall sunshine. The Gneiss up here dries quicker than B&Q emulsion and we drove on to Oldshoremore to check out a few venues and find some new bouldering rock. The beach bouldering showed some promise between the two bays of Oldshoremore and Oldshore Beg, the rock a delightful pink and tan gneiss sea-washed so clean you could eat off it. The warm dry rock and biting crystals felt good biting through the miasma of a few beers from the night before. 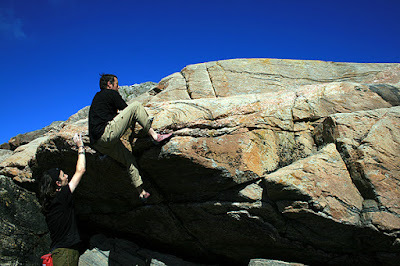 We moved on to the Akita boulder which Dave MacLeod had reported a while back. Despite being a superb piece of rock, the landings are poor and need more mats than we had... a committing venue we skedaddled from as a few damp holds caused a couple of nasty wipe-outs. Shame it isn't on a knoll of firm grass! However, the Rhiconich stone, having seen some drainage work, was safe as houses despite its height. We climbed some of the easier lines including the excellent roadside arete - Blooded - Font 6a - and I broke yet another hold on the Blood Music wall, it's 7c now and rising... good luck to anyone on this. Down the road to Ardmair for a shoulder session on the roof, with Ian Taylor engramming the local testpieces and looking fit if midge-bitten... he will be authoring the Stone Country Northwest Bouldering Guide next year so get those projects sent for the first edition! The next day Reiff saw a few new additions on the Pinnacle roof, probably variations on a theme but fun nonetheless: The Green Men Font 6c+ and Greenblue Font 6c, a cross-through combo on the Blue Men cave. The Wave Traverse low variation needs colder conditions (and more skin than I had!) and the big arete left of Leaning Meanie at the bouldering cliff is a must for the 8a boulderer out there... C'mon! !